The book "The Darkness" by Serbian author Aleksandar Vulin was presented at the 28th International Book Fair in Havana, on 16 February. It was prepared and printed in cooperation with the Serbian Embassy and the Cuban Book Institute. The Albanian media gave a considerable publicity to the celebration of the Statehood Day of Serbia, hosted by the Serbian Embassy, at Tirana International Hotel, on 18 February. ATA news agency relayed the address by Ambassador Miroljub Zaric with several photos from the reception. "Indian Express" and "Financial Express" daily newspapers published the texts prepared by the Serbian Embassy in New Delhi on the occasion of the Statehood Day, with the assistance of the Serbian PM's creative industries and tourism team. 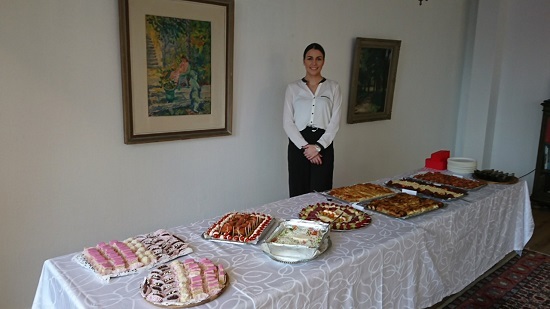 The ninetieth anniversary of the Serbian-Finnish diplomatic relations was marked at the Statehood Day reception, on 15 February, at the Serbian Embassy in Helsinki. At a reception on the occasion of the Statehood Day of the Republic of Serbia, Director of the Foundation of the sport club "Real sporting" from Gijón, German Robles, together with the vice-president of the NGO "Solidaridad Kosovo" Jesús Domínguez, presented Ambassador Katarina Lalic Smajevic and Consul Martin Simovic with club jerseys with their surnames on them, expressing gratitude in this way for their cooperation on the project regarding the Spanish team's school of football in Zubin Potok. Il Piccolo daily published a report on the celebration of the Statehood Day of Serbia at the Consulate General in Trieste, headlined "National Day of the Serbs in Trieste under the sign of Integration." The text quoted from the address delivered by Consul General Ivana Stojiljkovic on the hospitality of Trieste residents, gratitude to the Mayor Roberto Dipiazza, as well as her comments about the significance of the historical events of February 15th.